Online monitoring 24/7 of our installations. disinfection of pipe work in existing health care buildings. Drinking water is a sensitive matter and is subjected to strict regulations, especially when it comes to its treatment. 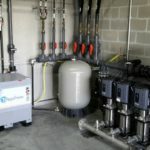 Therefor it is essential that the installed water treatment equipment is not only very well maintained, but also continuously monitored to ensure its proper functioning as well as to check the water quality because products are injected. The concentration of the active products in the water is strictly limited by legislation. Concentrations of free chlorine are measured as well as the water flow rate and the temperature. All these data are continuously logged and stored for a period of 10 years. Below is a graphical presentation of the logged parameters. This graph shows the proportional injection of sodium hypochlorite in a cold water circuit. Red: Free chlorine measured in the water close to the injection point. Blue: Flow rate of the water. Green: Temperature of the water used for free chlorine measurement. There is a growing need for more safety in public water circuits in sectors like health care. These increased safety measures should be affordable, environmentally friendly and should meet the requirements of the more and more stringent legislation for the disinfection of drinking water. In order to be sure that no contamination is present in pipe systems before putting them to use, an intensive rinsing and flushing program is prescribed, using biocides like sodium hypochlorite. 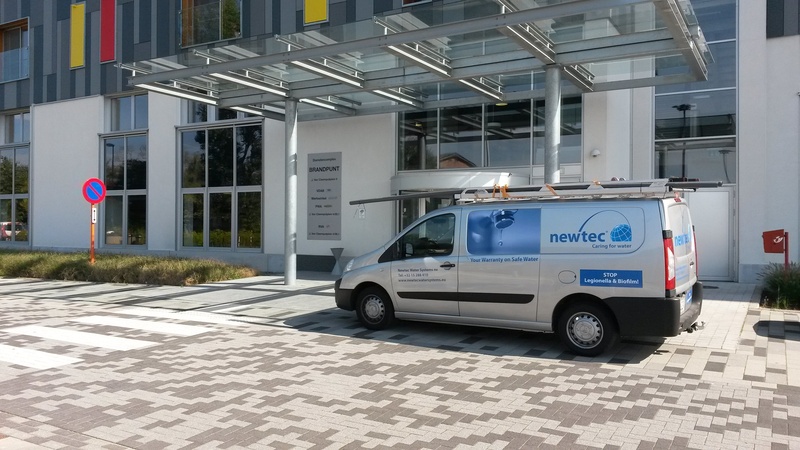 Newtec, as a specialist in the disinfection of drinking water pipe systems, is offering its know how and experience to its customers by means of carrying out a quick and safe disinfection using AqualityBox®. Newtec Water Systems wrote for this purpose a protocol that explains the work flow and that guarantees the quality and safety of the disinfection carried out. Additionally water samples are taken for analysis. The customer will receive a written report from a certified lab. 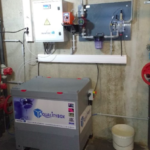 This initial disinfection is free of charge in case the customer decides to purchase the AqualityBox® system to be used as a permanent disinfection against biofilm and Legionella. 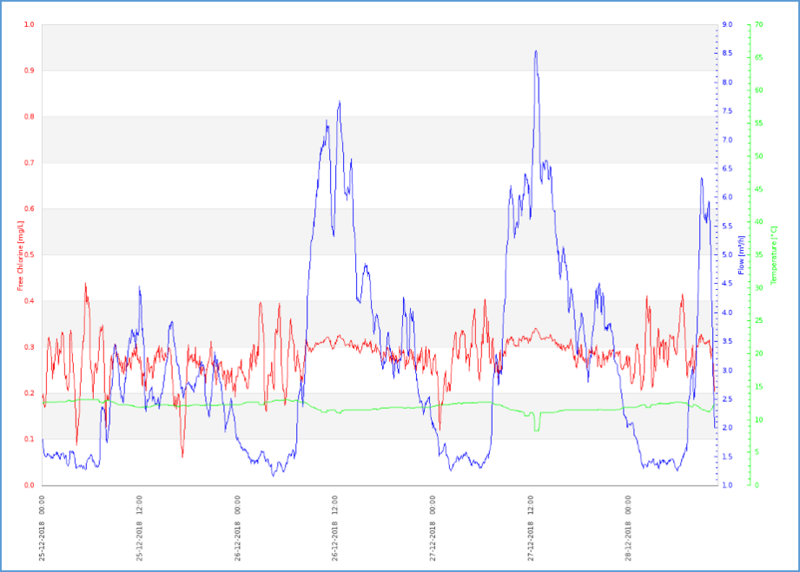 In that case the customer can economise on energy cost because thermal disinfection is no longer required and therefor the hot water temperature can drop below the prescribed level of 60°C. You could be asked as manager to perform a disinfection of the water pipes as part of a consultancy report. 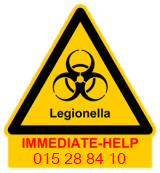 This means to flush the water pipes in order to try to eliminate the present biofilm and Legionella contamination. You can not find the right subcontractor able to carry out this job safely and according to the proper work flow and legislation? No damage to the technical equipment such as pipe work, heat exchangers, boilers, softeners etc…. Safety for your technical staff and Newtec personell. Maximum allowed concentration of the biocide according to legislation and guidlines. Drain water quality allowed according to the environmental legislation. VLAREM II in Belgium. Newtec’s own experienced technical staff will carry out the work (no subcontractor). Additionally water samples are taken for analysis. The customer will receive a written report from a certified lab.